With Sunny days and extreme weather its time for a soft makeup with smokey glittery eyes. Try these seductive shades to make your eyes pop this summer. Today I'm wearing LIT cosmetics glitters (Summer sparkles) with soft pink lips. 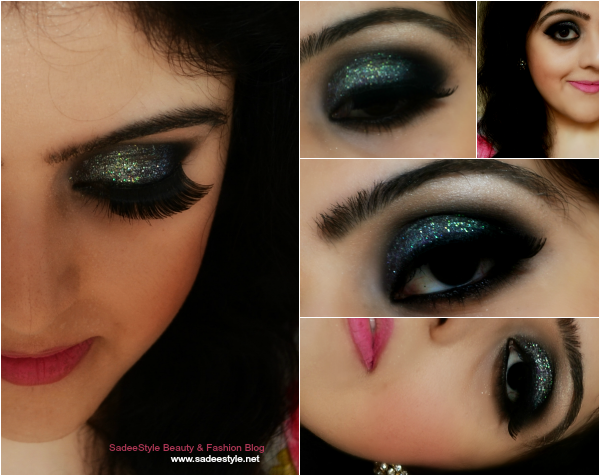 A most wanted soft and smokey look of this summer with funky glittery eyelook. Hope you like it. Kryolan Tv Paint Foundation Stick. Beauty Uk Compact Face Powder. First Date Blush by Famous Cosmetics -Scarlett. Sigma Beauty Premium Professional Brush. superb sadee !! This is so beautiful <3 MashALLAH !! How gorgeous! That glittery eye look is amazing. Awesome post, sweety!! You look stunning!! Would you like to visit my blog sometime? Maybe we can keep in touch!! Love it! You've done a wonderful job honey.